We first select 3 bankers as above. These will be the numbers that you DON’T want to play. It is usually easier and less confusing if you select the first 3 or the last 3 numbers in the lottery. 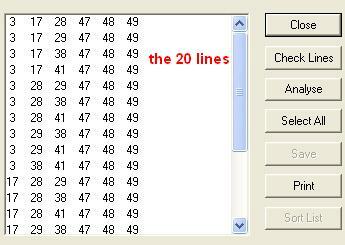 Then we go to the Number Sets filter and select the numbers we DO want to play. In the example below I’ve selected 6 numbers. And I have set the conditions Min 3 and Max 3 numbers from the 6 to come up. Any 3 from 6 is 20 combinations but if you didn’t know that just click on Build Lines and LotWin will tell you. Don’t get confused by the text on the top of this image ‘Total lines covered 246,820'. That would be the case if you didn’t have the 3 bankers. 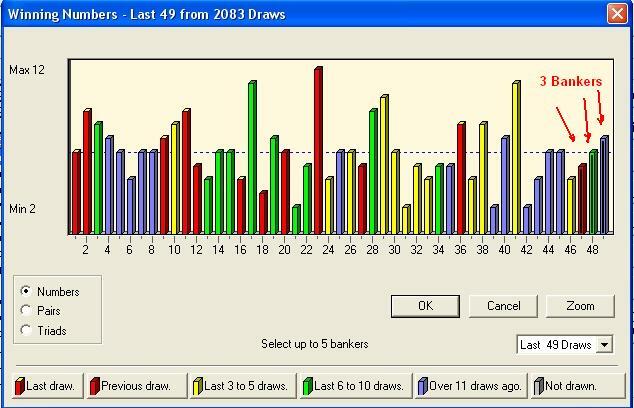 As you can see LotWin has created all the 20 entries of 6 numbers per line but 47, 48 and 49 were our bankers (the numbers we didn’t want to play). So we are left with 20 lines of 3 numbers each. If we were to play these entries for tonight’s La Primitiva it would have cost us 20 units and for ‘each line’ of 3 correct we would have a return of 675 units. (Each unit can be as low as 25p, check your account for the link). To be on the safe side I would also add a few entries of 2 numbers that would return 60 units if only 2 numbers were correct. It’s the same principle; 4 bankers and Conditions Min=2 and Max=2 instead of 3, which is 15 entries. 20+15=35 entries all together, if only a line of 2 is correct you get 60 units back, nearly double your stake. But 6 numbers are too few to play I hear you cry. Ok, let’s go higher. How about 16 numbers? That will be 560 combinations with a return of 675 if just 3 numbers from 16 were correct. Somebody show me how you can do that in your national lottery; the best wheel I know for 3 correct if 3 in 16 is 38 combinations and no lottery pays 38/1 for 3 correct. Of course you don’t want to play 560 combinations; firstly it’s the cost and second you don’t have the time to type them in. Bookmakers seem to be slow in online technology. I’m sure the LotWin team could add a routine in their 'Print Lines to Coupon' function that could send all your entries straight to your bookmaker’s website. That would require their co-operation to accept the entries but it's child's play, I've been told. Any interested bookmakers should contact the LotWin team; I can see a big business opportunity here for both parties. So what can you do? Well, you shouldn’t use our trusted Optimum Reduction in this case but the Standard Reduction is what is needed here. The reason is that as you only get paid for all correct you want to be as close as possible to the winning line. You should use Standard Reduction for ‘At least 5’ winning entries or ‘At least 3’ winning entries with ‘Maximum Returns’. As you have 3 bankers the Reduction will be for ‘At least 5’ correct. If all the above seems too confusing please post comments and/or ask questions.